Consider how much time you have spent discussing or practicing concepts relating to breath control and support in your time as a musician. We practice long tones, breathing exercises, and excerpts like Prélude à l'après-midi d'un faune for the duration of our flute lives. Our teachers tell us about the diaphragm, and use many varying explanations for the way our breathing apparatus works to allow us to make beautiful music. 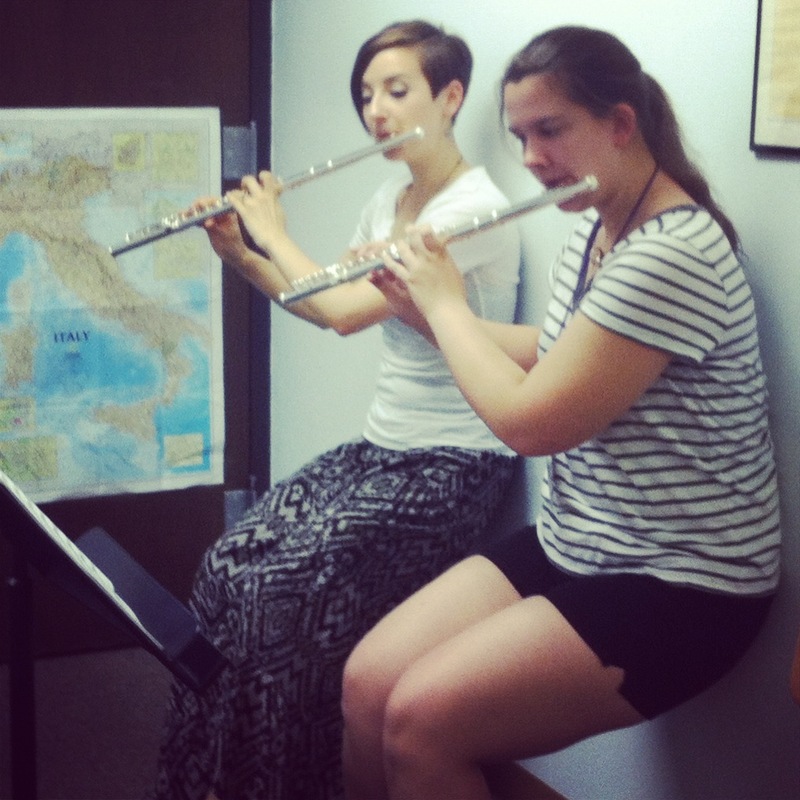 As wind instrumentalists, our air gives life to our music and a voice to our instrument. It is the determining factor in how our message is carried from conception to reception. We are often taught from a young age that support comes from somewhere: our abs, our diaphragm, from using the muscles to expel the air. There is validity to many explanations of “support,” but for the time being, I’d like to challenge you to think of support as something: an efficient airstream carried by the natural use of our muscles. Our breathing apparatus has to help us, but it does not create the sound, and will do its job correctly if we breathe in the way our bodies were built to. What truly supports our sound is a fast and consistent air stream, crossing the flute at the optimum angle. When teaching I tackle this concept from the start by making sure that my students are taking a natural and methodical approach to their stance and how they hold their instruments. I pull from a mixed bag of concepts that originate in Alexander Technique, Body Mapping and from experiences with my own teachers. Students are often better at using their bodies naturally at a young age, so I find that even my youngest students can grasp these concepts early on. Often, we focus on what our upper bodies do when we play our instruments, but pick up your flute as you would for a performance and notice for a moment what happens to your lower body. Most likely, you will find that one hip or the other is tense or locked, or perhaps you have limited mobility in your knees. My teacher, Katherine Borst Jones, often reminded us “you are a tree.” Your feet are grounded, but your legs (and hips) remain free to allow you to move in the breeze. Moving up from the roots, we must make sure to have freedom for movement in our hips. Try imitating the way you would throw a ball underhand with both your left and right arms. One hip will likely be more stiff than the other, and if you pick your flute up you’re just as likely to find the opposite shoulder is holding unnecessary tension. I found this awareness of whether my hips were locked in place during lessons with Jean Ferrandis, who is very conscious of any excess energy wasted on tension or unnatural movements. This part of our posture is not always associated with air use, but you will find that a freer lower body means more ease and efficiency in air flow and a more natural posture for the rest of the body. After evaluating our lower bodies, we come to the core, certainly a well-discussed and well-analyzed component of wind playing. In my own students, I encourage a natural use of the core muscles that is engaged, but never pushes on the air. We explore how to do this by using exercise balls and wall sits, amongst other physical activities. Older students have found common threads between an engaged, natural use of the core muscles and yoga. (A strong core goes a long way, but remember support is air, not a sit-up!). The goal is to use the large muscle groups to support your overall posture in a way that does not encourage you to constrict or push, especially with the abdominal muscles. All of these areas of sound production could be discussed at a much greater length, and the upper body is no different. I aim for my students to understand that the large muscle groups in their back (underneath the shoulder blades) can help to support the action of their arms, allowing freedom from tension in the shoulders and upper arms. A lack of upper body tension allows the lungs to expand as they are meant to, the air to move freely, and the sound to resonate. 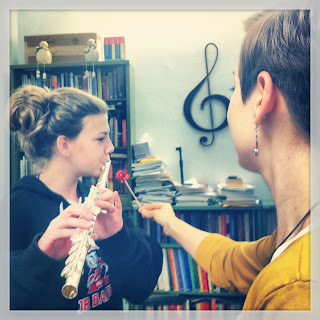 Finally, lift your flute to your chin or watch your students do the same. 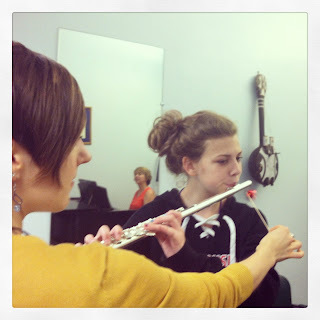 In a majority of my students I notice that the head moves forward to meet the flute, often with the chin down. I call this the “flutist’s thinker” (picture the famous statue). It seems obvious, but with so much to teach we often overlook this part of our students’ posture. Fixing it will create an instant improvement in breathing and air flow! Having evaluated how your student’s posture and stance (or your own) may be hindering a natural use of the muscles and breathing mechanism, the air should now be able to move more freely to support your sound. Just as I did previously, I’d like to encourage you to challenge the more traditional definition and think of support as the use of a natural, efficient air stream. In order to support the sound with your air, you must first consider the intake. To be sure you are using all the space that’s available to you in your lungs, try taking your normal “big” breath standing as you would to play. Then, do the same while you are bent at the waist with your neck and arms relaxed. Did you expand in a different way? Did you have more air? This is my favorite way to demonstrate that we can breathe in 3D! Now, replicate that breath while standing. With a refreshed concept of how much air we can take in, we must put it to good use by being sure that it moves fast, freely, and consistently. I would imagine we all feel we are doing this to some extent. If you’ve ever recorded yourself practicing and then listened back, however, you know that our perception of our playing and the reality are often different. I particularly enjoy finding more concrete ways for myself and my students to see the way our air is working (or not working) as we would like. The use of pinwheels to encourage air speed and consistency was introduced to me by Katherine Borst Jones. I use them in a variety of ways in my studio now, from showing students whether their air changes during or at the end of a phrase or long note, whether they are changing the speed or amount for varying dynamics, or if they are stopping their air during articulated passages. There are many breathing devices that show these aspects of “supporting” with the air, but I enjoy using pinwheels because of the affordability. 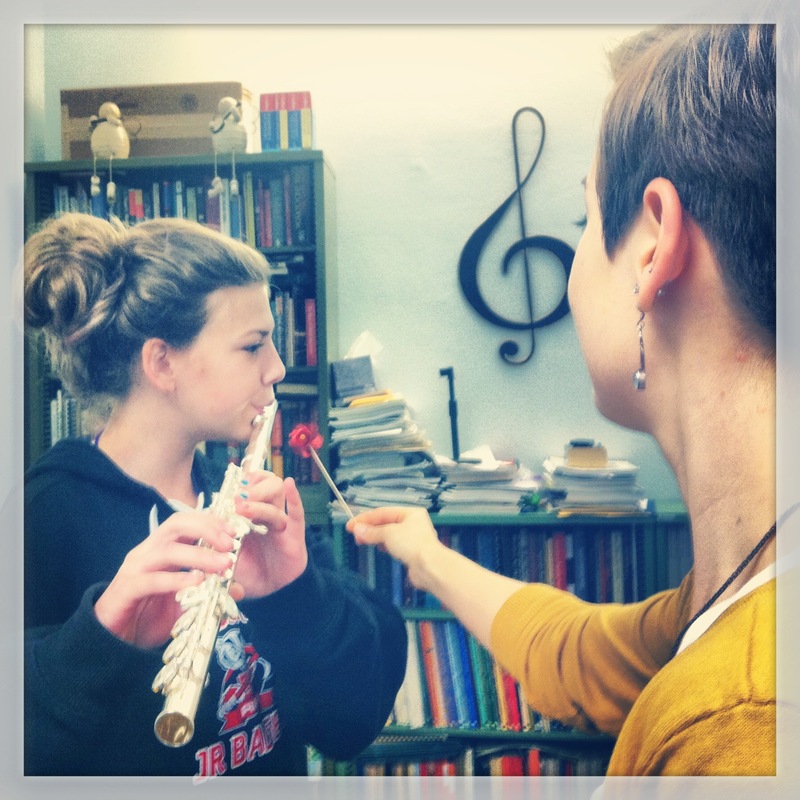 I send them home with students, and encourage them to tape them to their stands at embouchure level! The direction our air travels follows a close second in importance to the consistent speed it moves. If you remember the “flutist’s thinker” from before, it makes sense that our air is often directed too far into the flute. An added detriment is that an air stream that is aimed down will produce a more “direct,” laser-like tone up close that may be pleasing to the player but will project poorly in an ensemble or recital. The more distance we put between where the air leaves our embouchure and the edge of the embouchure hole where it splits, the better our sound will resonate and project. 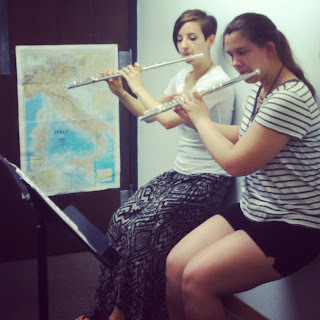 When teaching, I often provide analogies for my students encouraging them to picture their air traveling higher across the flute than it actually will. An example of this is relating direction to the pinwheel, asking them to picture a small wheel at the back of a recital hall that they must spin by blowing up across the flute and the top of the music stand. Even without touching on the intricate embouchure related aspects of moving the air freely, there is more than enough to consider when it comes to how we support our sound. Our entire body is engaged in breath control and creating the foundation and voice of our music. The air supports our musicality, tone, dynamics, vibrato, articulation....the list can go on for quite a long time. Air is truly the life of our music as flutists, and the best path to the strongest foundation and support is the natural and efficient use of our bodies.